There was very little surprise that Toby Porter was the hands-on favorite at Saturday’s Hooters Pro Cup race at Greenville-Pickens Speedway. Not only is Porter a track favorite among the fans, but Greenville is his home track. I fact, Porter’s personal racecar shop (not the shop housing his Pro Cup team) sits just beyond the turn two wall at Greenville. 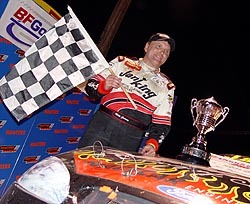 For the past several years, Garvey, who many argue is one of the best Short Track racers in the country, had been a regular with the American Speed Association. With that series falling into financial problems and shutting down, Garvey and his Jani-King team switched to the Pro Cup Series and their attitudes at the track have been different from day one. About 225 laps into the race, it looked like there would be no surprise. Except for a couple of laps at the very start of the event, Porter, who also won the pole, had led all night long in dominating fashion. However, then came Mike Garvey. Garvey, who clearly had the only car that could really compete with Porter, took the lead while Porter battled amongst lapped traffic on lap 230. “This is just awesome. 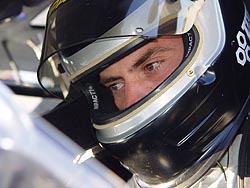 We are now back having fun at racing,” said Garvey after the race, who won in just his third career Pro Cup race. It almost wasn’t very fun for Garvey. Not only was he and the rest of the pack chasing Porter, but following the only round of pit stops, Garvey found himself having to fight from the back. Before the stop, Garvey was running third. After the stop, he was 10th. “When you get behind like that, this is a hard place to make it up. Luckily, the car just stayed good. The car didn’t get loose, in fact, it got a little tight. “I was frustrated after the stop. We had this trouble with the stops at Lakeland. I told the guys we need to get this straightened out. We can’t keep making up all these spots. It was nothing they did, I was just the way the pits are here and we got blocked in behind a car. Mike Garvey (#17) was one of the few cars that could pass on the outside. So while Garvey worked his way up from the back, Porter continued to flex his muscle. He came into the pits first and got out first. 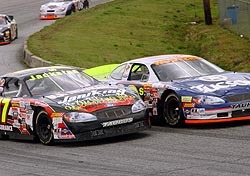 He had no real challengers until Garvey made his way to the front, with the exception of a little challenge from Bobby Gill here and there. Things didn’t go the way for Porter. He eventually slipped to third by the end of the night. “The first set of tires were good, but we just good loose,” said Porter. “I don’t know if it burnt the right rear tire off of it or what. I might have ran it too hard or had a little too much right rear spring. It was just loose as hell there at the end. “I didn’t see those guys coming. My spotter didn’t tell me either. I maybe could have saved a little bit if I knew those guys were coming, but oh well. What can you do? Local favorite Toby Porter dominated most of the race, but ended up third. But Porter eventually got mired in lapped traffic. With cautions falling his way and his car coming on, Garvey had made it up to third. But in a two-lap span, Garvey got by Gill for second and made a daring three-wide move between Porter and a lapped car to take the lead. “I got around Bobby and then we got right up on Toby,” added Garvey. “There was a lapped car there and I was debating if I could make the pass. I think they must have seen me because (the lapped car) pulled down and gave me a lane and I was able to go through. I started and stopped that move about five times on one straightaway. Thankfully the lapped car saw us and gave us room.